At The School at Columbia, our Kindergarten, Grade 1 and Grade 2 students are learning about themselves, their families and their community. The Primary Division program focuses on building a strong foundation for all aspects of learning, and developing skills necessary for school success. We teach literacy and math within a context of a conceptual, integrated, multi-disciplinary curriculum. The commitment to nurturing the young child is reflected in small classes with two teachers per class. Getting to know each child well is a priority for teachers in this division. Before the first day of school, each child is visited by her/his teachers at home or is invited to the classroom for a visit. The school year begins with activities that help students build classroom routines and structures, while achieving a sense of community with their classmates and environment. Teachers build relationships with students a variety of ways, getting to know their interests, personalities, family dynamics, and learning styles in addition to their academic skills through individual assessments of literacy and math. At several points throughout the year, teachers collect data on each student in order to differentiate instruction of foundational academic skills for a diverse range of learning styles and backgrounds. Learning objectives for each grade level that are appropriate for the developmental needs of the age are a mainstay of the Primary Division. We celebrate friendship every day and look forward to buddy time with our older class partners. We buddy skate in Central Park, buddy read in each other’s classrooms, and host the Grade 4-8 students to celebrate the 100th day of school. Our children are devoted to community service. We harvest pennies in the fall, collect food for the soup kitchen, plant flowers in the spring and participate in family service day with our friends and families. We have a K-2 roundtable where young philanthropists consider carefully where to donate harvest funds. Being in the Primary Division is like being part of one large extended family where each member is recognized and appreciated every day. Kindergarten students use their library time to familiarize themselves with the concept of a lending library, and to practice strategies for being responsible users of a shared community resource. Kindergarten library time begins with a shared story. Students are challenged to apply their growing knowledge of patterns to discover and discuss patterns within and between the stories we read. The second portion of library class is set aside for book selection. 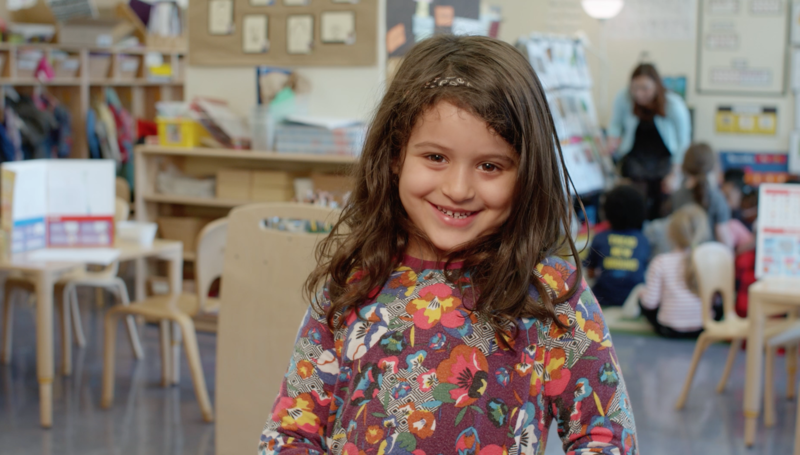 Kindergarteners are given a wide selection of age-appropriate materials to browse and are encouraged to make independent choices, allowing them to explore their interests through books, and begin to take ownership of their identities as readers. During the second half of the school year, Kindergarten students use their library class time to select books, further exploring their interests, and identities as readers. Students enjoy read-alouds and discussions focused on the themes of self and discovery, and are given opportunities to discover many different kinds of books. As the year progresses, students become increasingly independent library users. Kindergarten students develop their reading and writing identities as they explore the world of books and begin to emulate what they know authors do in the world! Their excitement spreads across many subjects and literacy-rich activities, including Read Aloud times, Shared Reading, Name Study, and writing for many purposes. They learn to develop independence, while at the same time practice collaborating with others. Studies of Wordless picture books, environmental print, and pattern books provide the initial framework for students to read and compose their own books. They learn to read the pictures and storytell off the pages in their books, building stamina as readers and growing their love of the classroom and school libraries. As writers, they learn to make plans, think about where writers get ideas, and share and celebrate their books with partners. Kindergarten students use their growing letter sound and word knowledge to continue gaining confidence and independence as readers and writers. Literacy skills are extended through continued instruction in word study, reading strategies and the craft and skill of writing. The children participate in discussions about stories read aloud and begin making connections to the text. They use the discoveries that they made about themselves and their peers to spark their writing as they explore poetry and informational, instructional and narrative nonfiction. Mathematical investigations in Kindergarten focus on the concepts of quantity, number, and pattern. Students explore quantity by developing strategies for counting and organizing objects. Tools such as the Ten Frame and Rekenrek (bead frame) give students a visual structure through which to understand number and communicate their thinking. Students begin to communicate their mathematical ideas on paper by writing numerals and drawing objects. Throughout the semester, children investigate patterns to better understand the relationships between numbers. They also share their mathematical thinking with their classmates and teachers. In the second half of the year, Kindergarten children continue to stretch their mathematical minds with daily number work. They apply their understandings in a variety of contexts in their school environment. Exploring measurement using nonstandard units such as paper clips and Popsicle sticks leads Kindergarteners to uncover the purpose of standard units and tools. Opportunities to generate questions of inquiry provide authentic contexts for children to collect, represent, and analyze data. Beyond ideas and questions, our Kindergarteners also investigate a variety of problem solving situations to apply their mathematical thinking. Collaborative and independent work, as well as an emphasis on communicating, thinking about and sharing multiple perspectives, plays an integral role in the math investigations. Grounded in the Kindergarten theme of Self, dance classes offer students the opportunity to learn all about themselves as safe and creative movers. Students are introduced to basic movement skills such as freeze, levels, direction and tempo changes, safety while still and traveling, and personal and relational spatial awareness. Students develop listening and observational skills during “Listening Circle” when the study theme of the day is introduced. During our unit on “Pattern,” students learn to recognize, repeat, invent, predict, and execute shapes and rhythmic movement phrases in simple and more complex repeatable patterns. They learn to perform basic choreographies to a wide variety of themes, musical styles, and song. Students practice safe and careful behavior while freely expressing themselves during dance activities. During the second semester, students continue to explore the Kindergarten theme of Self as part of the curricular concept of Discovery. Students learn to express their ideas and communicate their understandings by creating their own movement interpretations through many units of study including Nursery Rhymes. They are introduced to basic principles of yoga such as self-discipline, focus, spatial awareness, balance, and relaxation techniques through the study of a variety of yoga poses. Students discover tools needed and used for dance. Students also discover more about themselves by listing all the parts of the body and then using their bodies as measuring tools to figure the size of the dance studio. Students learn to discern subtle differences in music and movement qualities by dancing to music from many cultures. Movement vocabulary and self-expression are developed through Dancing the A B C Train, Story Dancing, and Discovering Why I Love To Move solos. Students build self-confidence, learn to make connections with dance and other studies, and are encouraged to understand the joy and importance of movement in the world around them. Since young children are innately musical, the Kindergarten concept of Pattern connects naturally to the music curriculum. Through performing musical patterns with their feet, their bodies, the instruments and their voices, they develop their musicianship as they reinforce the concepts of rhythm, tempo, melody and form. They discover their singing voice, experience the steady beat, explore musical instruments, and engage in musical dramatic play. In addition to instruction in the music room, all teachers and students gather once a week for a Kindergarten sing-along. In the second semester, the integration of the music curriculum with the Kindergarten Discovery unit gives the children an opportunity to continue their exploration of the basic concepts of music. The students discover dynamics: loud and soft; tempo: fast and slow; melody: singing and pitch matching; rhythm: steady beat and rhythm patterns; movement: rhythmic and melodic interpretation; improvisation: stories and songs; instrument technique: pitched and un-pitched percussion; and ensemble work. In Kindergarten, students are learning scientific skills and developing scientific attitudes through the concept of Pattern. They are learning to gather evidence, ask and answer questions, make predictions, find patterns, and communicate their ideas. Their focus is on how scientists gather evidence using their senses as well as use tools to extend the senses. Students explore with magnifying lenses, pipettes, pH strips, and measure length using cubes, mass using a balance, volume with a graduated cylinder, and temperature with a thermometer. They make and share their discoveries as Kindergarten scientists throughout the semester. In the second semester, Kindergarten students continue to develop the scientific skills of gathering evidence, asking questions, making predictions, finding patterns, and communicating their ideas. To explore the concept of Discovery, the children investigate what it means to be alive and put living things into categories. They focus on a different class of animals during each visit to the Discovery Room, including mammals, reptiles, amphibians, fish, birds, insects, earthworms and crustaceans. They learn about the characteristics of each group and consider how they are similar to and different from themselves. In Kindergarten, social emotional learning skills and objectives are woven into the children’s study of pattern. Students learn to recognize patterns throughout their day: in their daily routines, their interactions with others, and their own emotional responses. As their conceptual understanding deepens, they acquire a more nuanced sense of both their own unique qualities and of how they fit into the larger worlds of classroom and home. In the first semester, children are also expected to master age-appropriate friendship skills, recognize and name their own feelings and the feelings of others, employ self-calming techniques when they become upset and begin to take responsibility for their behavior and choices. In the second half of Kindergarten, children learn to become more self-aware and to manage their own emotions and behavior. They learn that choices have consequences and that hard work produces measurable results in which they can take pride. Friendships deepen and children begin to learn how to resolve conflicts independently, using words to express their feelings while listening to the needs of their friends. Children begin to apply self-regulation strategies they've been taught such as asking for a break, sitting next to a good learning partner, or taking a deep breath when they are upset. Students also learn to appreciate the visible and invisible aspects of their identities that make them unique. The Kindergarten Spanish Curriculum exposes students to the world of second language learning through active, multi-sensory lessons in a safe and engaging learning environment. Students learn a variety of Spanish songs and games that become a part of their Spanish routine. This semester kindergartners connect to our study of Pattern by learning basic phrases and expressions in Spanish. Students learn the names of colors, numbers and shapes to explore and create patterns. They also learn to express likes and dislikes and to identify parts of the body. They practice this new vocabulary through a variety of activities ranging from artistic and musical to kinesthetic. Students in Kindergarten learn how to use an iterative approach to solving problems and testing ideas through coding. Using their personally assigned world wide web accessible code.org accounts, students learn how patterns are used to create algorithms to solve puzzles and mazes. Creating loops, sequences and variables allow students to develop critical thinking and problem solving skills; a skill set that we hope transfers to all their disciplines. Students will continue to explore these themes by programming robots like the Bee-Bot, a tool for teaching sequencing, measurement and estimation. In addition to coding, Kindergarten students continue to use technology to extend, reflect upon and display their understanding of learning content areas. Apps like Book Creator, SMART Notebook and LetterSchool are a few examples of applications students use to support learning in Kindergarten. In the Art Studio, Kindergartners develop basic skills while exploring the exciting possibilities of materials. The students first engage in a rich study of painting. Artists discover how the primary colors can be mixed to create many new colors and explore different ways to make marks with paintbrushes. The students also work with collage learning to cut, tear, arrange and overlap materials. In connection with the integrated curriculum, students investigate the concept of pattern through beading. In the second semester, students explore a wide variety of materials and tools in conjunction with the integrated concept of Discovery. The students investigate the many possibilities of three-dimensional art, gaining experience with molding clay, sculpting wire, constructing wood, and manipulating paper. In addition, students practice observational drawing skills while investigating nature in the park. Students also practice the printmaking process by stamping unexpected tools such as found objects, fruits and vegetables. Delighted by these activities and materials, students become skilled artists and creative problem solvers. In Kindergarten Wellness, the students learn and practice the 8 basic locomotor skills: walking, running, hopping, jumping, skipping, galloping, side-sliding, and leaping. In addition to this, students also learn the four major pathways, straight, diagonal, curved, and zig-zagged, while reinforcing their locomotor skills. The students learn about personal space and how to maintain it as well as general space and how to effectively work within general space. They participate in discussions about self-control and how it can help them to stay in their personal space. Kindergarteners work in small groups and in partnerships to develop cooperative learning skills. First grade students enjoy use their library class time to choose books from an increasingly broad collection of titles, exploring new types of books. First grade library time is also used to share and discuss books about change and life cycles, encouraging students to draw connections and correlations between the changes they’re observing in their classroom projects involving butterflies and chickens. At the end of the year, students are given an introduction to the basic organizational principals of the library, and begin to become increasingly independent and responsible library users. First grade students read across a variety of genres in order to explore the concept of Connection and the theme of Family. They learn to develop and build strong reading habits as they explore the various facets of their reading identities. As readers, they make connections between literature, events in their own lives and their world knowledge. Students learn about the traditions of oral storytelling through their study of well-known Folktales. They study the story elements, and learn a variety of folktales well enough in order to retell and adapt them for their own creations through the lens of digital literacy. As writers, students learn that their lives are filled with stories and that writing is all around them. They move through the writing process, exploring where writers get ideas from, and work to draft and revise their own stories. Word study skills and decoding strategies are strengthened as students explore similarities and differences in sounds and letter patterns that help them both read and write unfamiliar words. Students also grow their bank of sight words, using them to read and write more fluently. In the second semester, the study of Change provides opportunities for the first grade students to explore both concrete and complex changes in literature. Beginning with an Eric Carle Author Study, the students explore the difference between fact and fiction while continuing their work on problem and solution from earlier in the year. Through an in-depth study of nonfiction, the students learn about various text features and practice activating prior knowledge before reading a text. They work on making deeper connections and reading for a specific purpose. As writers, they think about their purpose: to inform, instruct or persuade and craft pieces to get the desired point across. A Poetry unit allows the children time to hone their observational skills in order to write poetry that describes objects, events and big feelings. Spelling, vocabulary, decoding and grammatical skills are strengthened as the students continue their exploration of word structure, word meaning and sentence structure. Mathematical investigations in first grade focus on developing children’s number sense and early conceptual understanding of operation. From counting and comparing to sequencing and sorting, children are encouraged to make connections between concrete and abstract representations of number and quantity. Explorations with the twenty-frame model and other visual images develop children’s understanding of the relationships between basic facts, which in turn informs their ability to compute with these facts flexibly, efficiently, and accurately. Meanwhile, story problems provide real-life contexts for understanding addition situations. A global emphasis on interpretation and representation helps children visualize the mathematical actions and meanings embedded in many types of word problems. Throughout the year, students have opportunities to engage in both individual and collaborative work. In a variety of contexts, first-grade mathematicians deepen their understandings in ways that help them make sense of the mathematics in their lives. In the second semester, Grade 1 students investigate number, geometry, and measurement. The beginning of the new calendar year launches an in-depth study of clocks and time. Within this unit, students explore the numerical structure and patterns of the calendar and learn how to use it as a tool. Doubles, near doubles, ten’s plus, and “ways to make ten” facts become “helper facts” for solving more challenging problems. The closed number line and other models, such as the hundred chart, play an important role in supporting students in their understanding of money and the relationship between addition and subtraction. A 3D-geometry exploration invites students to examine attributes by identifying, sorting, and classifying objects in their surroundings. The end of the year culminates with an integrated study in which students estimate, calculate and apply their understanding of standard and nonstandard tools and units of measurement. Throughout the year, students regularly engage in authentic problem-solving situations. Finally, across investigations, students further develop their mathematical vocabulary and communication skills by working both independently and collaboratively. In Dance class, first grade students solidify their understanding and execution of basic movement skills such as freeze, levels, musicality, directional changes, locomotor movements, safety while still and traveling, and personal and relational spatial awareness. Students continue to develop their abilities in listening, observation, and cooperation while they practice more refined performance skills such as changes in energy levels, rhythmic patterns, and movement qualities. They learn to relate what they are studying in other disciplines, to all the activities they are exploring in dance, such as Lines, Shapes, and Feelings, Traveling Trios, and Dance the Connections. During the units of study on Family and Connection, students formulate connections on physical, emotional, and intellectual levels. They learn to work with a partner and an ensemble while creating their own movement interpretations of nature, of lines and pathways, of their personal narrative writing about their family experiences, and of their museum experiences. During the Museum Dance Project, each student choreographs, titles, and rehearses his or her own museum dance. These pieces are videoed and posted on TSC’s “The Tube,” for students and families to view. In the second semester, students continue to develop technical and improvisational skills and learn to apply specific intellectual concepts to each of their dance projects. Students practice traveling dance steps in synchronized trios. Based in the curricular concept of Change, students experience advanced Puppy Play, partner dancing, and intermediate yoga, reflecting on how they have changed since first learning these activities one year ago. Students also expand their imaginations and study the poetic changing of words by choreographing to nonsense poetry and Dr. Seuss stories such as “Eletelephony” and “The Thinks You Can Think.” They demonstrate problem-solving techniques by creating their own Save The Solar System invention dances that illustrate changing pathways of moving energy. After studying the stage areas, students learn to track and record these dances on a Stage Area Map. Through study, rehearsal and performance, students build self-confidence, grow in creative expression, and develop a new level of understanding about how dance can be a powerful medium for communication of ideas and connection with the world around them. In first grade Music class, the students work on recognizing and performing a steady beat using a variety of means such as movement, body percussion, and instrumental playing. Instrumental playing includes the use of un-pitched percussion instruments and barred instruments; xylophones, glockenspiels and metallophones. Movement and instrumental improvisation are explored through games and stories, which support the overall theme of Family and the concept of Connection. The semester culminates with a Family Concert, featuring songs and dances that reflect our diverse community. Preparing for this concert offers the students the opportunity to develop their singing skills and musical memories, while expanding on their song and dance repertoire. The children strengthen their musicianship and community ties, along with learning about performance etiquette through this joyous experience. In the second semester, Grade 1 students work on identifying rhythmic patterns such as the quarter note, quarter rest and eighth notes, which are labeled ta, ta rest, and ti-ti. In the context of playing musical games and analyzing the sentence structure in songs, they practice reading, writing and composing patterns using these rhythmic values. Dramatization of stories gives the students opportunities to explore improvising on the barred instruments and small percussion, along with acting, moving and singing. Students are also introduced to “Music Street” where the pitch syllables Sol, Mi and La live. They learn to sing, read and aurally identify patterns comprised of the pitch syllables Sol, Mi and La. They also practice reading simple melodies using the Curwen hand signs, using their own fingers as a staff and also reading from a two line staff. Through these activities, they experience the concept of lines and spaces in musical notation, thus preparing them to read from a full five line staff next year. Throughout the semester, students master many new songs and dances, related to the curricular theme of Change. In the Grade 1 kitchen science unit, students explore everyday chemical and physical changes. Experiments include dissolving various solvents in water, growing salt crystals, making butter and creating simple chromatograms. In a series of yeast experiments, children investigate how changing one variable at a time affects the outcome. All of these experiences help students develop the scientific skills of asking questions, making predictions, noticing patterns, recording observations and communicating their ideas. In the second semester, students explore the concept of Change through lifecycle investigations. They study the various organisms growing in the Discovery Room or homerooms, including darkling beetles, various plants, painted lady butterflies, tadpoles and chicks hatched from eggs. Students strengthen their observation skills through discussion and by making notes in their science folder. Experiments include recording mealworm food preferences, noticing how temperature affects the rate of metamorphosis, and investigating how withholding light, water or soil affect plant growth. Trips to Riverside Park throughout the year help to deepen students’ understanding of Change. In first grade, social emotional learning skills and objectives are embedded in the children’s study of Connection. Children investigate essential questions involving the myriad connections among and between people, themselves and the natural world. A deeper understanding of themselves as unique and important members of their own families and communities is acquired as children begin to explore the complex relationships among people in many different settings. Working in large and small groups, the children also work toward developing an emotions vocabulary, learning to identify and respond to nonverbal cues of others, showing effort and persevering through challenges, and assuming responsibility for one's own actions and attitudes. In the second half of Grade 1, social emotional learning is integrated into the study of Change. Children began to appreciate the ways in which their own hard work brings change in the form of increased competence in multiple areas. They began to set realistic goals for themselves, and to feel pride in mastering new skills. In their friendships, students practiced taking turns and sharing, as well as resolving conflicts and being flexible. Gradually, students developed an awareness of the ways in which their actions affect those around them and the ability they have to change situations for the better. As they moved toward second grade, the children also became more independent as learners. Grade 1 students grew in their understanding of the need to be responsible for their work and for their actions throughout the day. Students practiced making positive contributions to their classroom and the larger community. Grade 2 has a year-long theme of Community and focuses on the concepts of Structure and Expression. Students come well-prepared for the emphasis on independent and cooperative learning opportunities. We begin with activities to build a grade level community filled with the collective strengths of the children. Students see that they are each unique and together complete. They investigate how physical and organizational structures help the members of a community grow and prosper. They examine the ways families, The School, and other communities express their affiliation, and how these communities meet the needs of each member and help to make the groups within successful. First grade students continue to explore the theme of Family and the concept of Change during the second semester. Students work to notice and make change in our community as well as in the wider world. As they begin their studies of change in the greater community, students investigate change in terms of time, seasons, and the calendar. In a continuation and expansion of this study, first graders use the research question, “Where do families get their food?” To guide the inquiry, students visit farms, farmers’ markets, grocery stores, and local food organizations. From there, the students engage in several learning experiences that help them understand how food makes it way from farms to tables. After studying natural change, their focus shifts to how to influence change in the wider world. They learn about problems in our community, such as pollution, recycling, trash, and staying healthy. In a final share, first graders present the facts about these topics and suggest small changes their families could make that could help solve these larger issues. In first grade Spanish class, students connect their knowledge of the language to the theme of Family as well as to their daily school life. Students make connections to others by learning how to describe themselves in Spanish and learning how those physical traits make us similar and different to other people. Students apply their language skills by practicing new and old vocabulary in Spanish through didactic activities, games and songs. Spanish classes are designed so that every student has the opportunity to listen to, speak, read and write key vocabulary in the target language. They also make literary connections while reading various books that highlight the theme of Family. Students are learning about families and cultures that have similarities and differences from their own. Throughout the semester, students discover how we can create different types of connections to others and how that can change our perspective of the meaning of family. In first grade, we strive to continue building a love of language and cultural learning where students are eager to participate. In the second part of the year, students explore the concept of change beginning with the seasons unit. Students learn new Spanish vocabulary like the months of the year, the weather, the seasons and different elements of each season. In April students delve into the spring unit continuing to track the journey of the monarch butterflies to and from Mexico. All of our units have cultural components that connect to Mexico. We end the year studying the farm and its animals. Students learn how to describe animals and compare them by physical traits. Students apply their language skills by practicing new and old vocabulary in Spanish through didactic activities, games and songs. Spanish classes are designed so that every student has the opportunity to listen to, speak, read and write key vocabulary in the target language. In first grade, we strive to continue building a love of language and cultural learning where students are eager to participate. Students in first grade are becoming skilled at using technology learning tools in their classroom like laptops and iPads. Using their personally assigned iPad, students are developing routines, safety protocols, and understandings of symbols inherent in iPad applications. These understandings promote independent use across disciplines. In addition, first graders learn how to use an iterative approach to solving problems and testing ideas through coding. Using their personally assigned world wide web accessible code.org accounts, students learn how patterns are used to create algorithms to solve puzzles and mazes. Creating loops, sequences and variables allows students to develop critical thinking and problem solving skills; a skill set that we hope transfers to all their disciplines. Students engage in the study of simple machines through the use of Lego Education WeDo kits. Students learn to construct simple machine models and program them to come to life. Through construction and programming, students reinforce ideas around problem solving, collaboration, design, and engineering. Students learn about motors, gears, pulleys, cams and continue to make real world connections. This unit culminates in the construction of each student's very own automaton constructed from everyday materials. Grade 1 students learn how to use an iterative approach to solving problems and testing ideas through coding. Using their personally assigned world wide web accessible Scratch and Lightbot Jr accounts, students learn how patterns are used to create algorithms to solve puzzles and mazes. Creating loops, sequences and variables allows students to develop critical thinking and problem solving skills; a skill set that we hope transfers to all their disciplines. Students engage in the study of simple machines through the use of Lego Education WeDo kits. Students learn to construct simple machine models and program them to come to life. Through construction and programming, students reinforce ideas around problem solving, collaboration, design, and engineering. Students learn about motors, gears, pulleys, cams and continue to make real world connections. In Visual Arts class, first graders develop their creative and problem-solving skills while learning how to work responsibly and respectfully in a collaborative space. As part of the first semester’s focus on the connection theme, students explore lines, shapes and colors through a variety of art mediums. First, they explore various lines and shapes with drawing materials, and then they learn to create lines by sewing. Then the students learn about sewing materials and practice threading a needle, sewing, and finishing sewing by making double-knots at the end. The first graders then move to the collage unit and focus on cutting and combining various shapes to create things they know. In the second half of the year, Grade 1 students explore and deepen their understanding of the yearlong concept of Change and Connection through artistic expression in the art studio. Following the collage study in the first semester, the students begin the semester with studying printmaking techniques. They learn to change a collage into collagraph prints. The students continue to investigate the artistic element of three-dimensionality and how to change the forms and connect them together. They explore unique qualities of materials such as paper, fabric and clay, and practiced construction techniques in their sculptural work. The experience with a variety of materials this year allows them to expand their knowledge and skills for art making and creative problem-solving. The first grade students explore a variety of Wellness topics this year. They review and practice concepts of personal and general space, how to move safely in close proximity to others and further their mastery of locomotor movements. In addition, students gain an understanding of nutrition related topics and how to make conscious food choices based on a traffic light concept (red, yellow, and green light food categories). The students make the distinction between tossing and throwing techniques, while solidifying their catching skill set. The first graders continue to explore different types of equipment both independently and in small groups and also begin a study of balance, flexibility and strength. Second grade students learn and think about the structure of the library space and the structure of the library’s organizational system. Second graders begin using different strategies and tools, such as shelf markers, to help them become more independent library users. Library class time is also used to expand on classroom studies, including work on realistic fiction. Students read and discuss realistic fiction picture books and explore what distinguishes a realistic fiction story from other genres of fiction. During library class time in the second semester, second grade students are encouraged to pursue their interests as they select books from an increasingly broad collection of picture books, chapter books, and nonfiction titles. In April, during National Poetry Month, second graders read and discuss poetry, focusing on narrative poems, and explore the library’s poetry section. As the year progresses, students are given more independence as they navigate the shared space and work towards becoming more effective and confident library users. Second grade students explore the concept of Structure through their discovery of different genres. They learn about the organization of their classroom library and spend time reading a variety of poetry, narrative and nonfiction texts, discussing the form and function of each genre. Through the study of poetry, students practice reading fluently and expressively as they notice specific text structures and use those structures to help guide their oral reading. They also strengthen their overall reading comprehension skills as they apply strategies such as visualizing, stopping to think about new word meanings, paying attention to story elements and making connections as they read picture books, early chapter books and longer chapter books. Students write their own poems, examining the differences between a variety of poetic structures while thinking about the tools poets use to express themselves. Phonetic skills, writing conventions and mechanics are explored systematically. Students apply these rules to their own writing, so that they can best express their thoughts and ideas clearly to an audience. The second grade students continue to develop as readers and writers in the second semester as they examine the structure and elements of narrative and informational nonfiction. Expanding on their previous narrative work, the students thoughtfully discuss authors’ uses of detail, description and dialogue. They read a variety of personal narrative texts, both as a class and individually, and participate in meaningful conversations while making interpretations about the more complex story elements of character development, plot, theme and point of view. They then incorporate these craft skills into their own piece. The students then launch into an in-depth look at different forms of informational nonfiction writing. From books, to websites, to advertisements and signs, the students explore the ways writers use fact, opinion, persuasion and various formats depending on the audience and purpose of the piece, and begin to summarize and synthesize the information to deepen their understanding. They gather information from print, interviews and observations, and then combine the facts, their opinions and the art of persuasion into carefully crafted pieces aimed for specific audiences. Spelling, decoding and grammatical skills are strengthened as students continue to explore word structure, sentence structure and story structure. A Poetry Study enabled the students to look at the world through a poet’s eye and experiment with different structural elements. Through careful examination of published poems, students learned the importance of word choice in clearly and effectively expressing one’s thoughts and ideas and notice how the line breaks, white space and purposeful use of punctuation affect the oral expression of the piece. They then applied these understandings as they collect meaningful and descriptive language about their experiences and craft and recite poetry. Throughout the semester, students learned and applied many literacy skills, such as word and sentence structure, vocabulary, and fluent and expressive reading. They then transferred this knowledge to books read aloud or independently and to writing in other contexts. Classroom learning experiences give students the opportunity to continue building their understanding of number relationships and their repertoire of computational strategies. Students also make connections between math and other disciplines as they explore data collection and analysis as well as attributes of different geometric shapes. Through explorations, students develop their math vocabulary and communication skills. As they progress throughout the year, students engage in both individual and collaborative work focused on creating meaning around the mathematics in their lives. With a critical eye, Grade 2 students use a variety of addition and subtraction strategies in the second semester. They reason about the structure of each strategy and the ways in which particular strategies match best with particular numerical situations. Overall, the curriculum emphasizes accuracy, flexibility, and efficiency, and students represent their thinking with models such as the open number line. Across tasks, children are encouraged to build problem-solving habits of mind such as perseverance and collaboration. Within the domains of communication and authenticity, students record their mathematical processes in order to share their thinking with others, and they notice mathematical situations in their everyday lives. The term includes mathematical investigations in which students apply their addition and subtraction reasoning skills to real-life contexts. These investigations focus on group work, representation, and organization of thinking on the page. Within each inquiry, students further develop their mathematical vocabulary and communication skills. Throughout the term, students use concrete tools to reason with time, money, and measurement concepts. Dance class is tightly woven into the second grade curriculum. The children have various creative movement opportunities based on picture books, poetry, nature and their own imaginations. They greatly enjoy finding and creating structure through movement. Alongside all of this challenging work, dance technique skills are introduced and developed through the warm-up, stretch, and traveling sequences that are a part of every class. Each child’s social and emotional growth is nurtured by working in small groups and partnerships, sharing dances, playing the role of a good audience member, respecting each other, oneself and the studio, as well as being consistent, cooperative and enthusiastic participants in class. We began the semester focused on a performance study. Each class transformed a beloved tall tale into an integrated performance showcasing dance, music and art. The children did a lovely job and greatly enjoyed sharing their work with the 2nd Grade community. Upon returning from Spring Break, the children worked on improvisation through story dancing and even created small group dances based on the picture book Imagine by Alison Lester. This led beautifully into a larger project based on various sculptures from our visit to Storm King Arts Center. This extensive choreography project focused on and introduced the “ingredients of dance" – time, space, energy and body. The children worked very hard and produced beautiful work that can be seen on The Tube. Alongside all of this challenging and creative work, the students continued to build on their dance technique skills through the warm-up, stretch, and traveling sequences. Music in second grade is an exciting time for students to express themselves through singing and moving. Students study rhythms and rhythmic notation (including half notes, quarter notes and eighth notes). During the Structure unit second graders also studied the structure of a song including AB Form and were able to follow a listening map. Second grade students make connections to poetry by composing songs for their Poetry Celebration. They sing a varied repertoire of songs and will continue expressing themselves through music and movement in the upcoming semester. In the second semester, Grade 2 students study the structure of an orchestra including all the instrument families (strings, woodwinds, brass and percussion) and where each instrument family sits in an orchestra. Second graders study tempo (the speed of the music) and dynamics (the volume of the music) using visual and aural representations. Second grade students learn scientific skills and develop scientific attitudes through a study of organisms and their habitats. At the start of the semester, students visit Black Rock Forest to research and experience the forest habitat, then draw comparisons to city environs back at home. We then focus in on the world of birds, and students learn to be close observers, ask questions, and use their observations to develop scientific ideas. Student scientists study nests, adaptations, and bird behavior. A special treat will be learning about birds of prey to strengthen an understanding of food chains. An important focus of second grade is communicating ideas; throughout the unit each student maintains a scientific folder where ideas, observations, scientific thinking, and questions are recorded. During the winter unit, students engage in the engineering design process as they develop prototypes for bird feeders. They begin by researching feeders in terms of materials, construction, and design. Using their newfound knowledge, they brainstorm their own feeder designs and draw up a blueprint. Students then work through challenges as they transform their 2D blueprint drawing into a 3D feeder prototype using various materials. In the spring, students explore concepts of electricity and circuits. Students explore various ways of constructing a circuit and experiment with materials that are conductors and insulators. In the first half of Grade 2, social emotional learning skills are integrated into the study of Community. Children learn how people express their identities and their feelings and begin to appreciate the many ways in which diversity strengthens a group. They also become aware that people can express the same feelings in different ways and that others may have perspectives that differ from their own. Working in the whole class and in small groups, children develop empathy and learn to resolve conflict through negotiation and compromise. They learn to assertively express strong feelings, and become increasingly comfortable taking academic risks and persevering through challenges. They are increasingly independent in completing their work, and they take responsibility for their actions so that the community can function effectively. Finally, as part of their understanding of community, children develop an understanding of bullying and bystander behavior, and learn how to be an ally, standing up for themselves and for others. In the second half of Grade 2, social emotional learning skills and objectives are built into the children’s study of Communication. Through lessons that encourage flexible thinking, children work in large and small groups to practice active listening, using an appropriate tone of voice and expressing strong emotions. Children are given opportunities to practice perseverance and and understand the importance of taking responsibility for their own actions and attitudes. This semester students explore the concept of Structure by gaining exposure to new language structures and vocabulary. They learn key vocabulary to be able to communicate and interact with their peers and understand their surroundings in Spanish. We study the theme of Community by getting to know each other, making connections with the people in the classroom and the spaces in the school. Students will use the four essential language-learning skills, listening, speaking, reading and writing, in order to expand their vocabulary and grammar skills. Specific vocabulary units will pertain to physical traits, objects in the classroom, places in school, subjects at school, days of the week and useful expressions. In the second semester, students work on a research unit on The Caribbean. Students begin by discovering that there are three Spanish-speaking islands in The Caribbean by interviewing a few faculty members in our community. They explore different cultural elements from each island, such as food, music, people and nature. We end the year studying El Yunque, the rainforest in Puerto Rico. Students learn about the flora and fauna of El Yunque and practice how to describe and compare in Spanish. Students apply their language skills by practicing new and old vocabulary in Spanish through didactic activities, games and songs. Spanish classes are designed so that every student has the opportunity to listen to, speak, read and write key vocabulary in the target language. In Grade 2, students are learning Design Thinking, the process by which designers, engineers and scientist problem-solve. With a focus on arts, crafts, carpentry and engineering, students are introduced to the concept of “Making” and the Do-It-Yourself (DIY) and Do-It-With-Others (DIWO) culture. Students collaborate to design, create a prototype and final iteration of a selected product. Skills sets that promote collaboration, decision-making, and self-directed learning are reinforced. In the second half of the year, students explore electricity as part of an integrated project with Art and Science. Students examine how electrons flow through circuits and conductivity in all three environments. Students later apply their conceptual understandings by inventing with simple circuits using the Makey Makey circuit board. After, electronic textiles and wearable technology are introduced with students creating Mii Dolls. This unit requires that children design circuits, sew them in place, test and troubleshoot their connections and finally complete a rag doll with a functioning LED in both Technology and Art spaces! In the Art Studio this fall, as part of the first semester concept of Structure, the students begin with a painting exploration. They explore color mixing and the expressive qualities of paint by making a wide range of colors with a limited palette of red, yellow, blue and white. Using this exploratory experience, each student makes a collage with complementary colors of their choice. They then learn how the color wheel is organized and how that structure can help an artist create a composition. While studying works by professional artists such as Alexander Calder, Louise Nevelson, and Isamu Noguchi, in school and at the Storm King Art Center, students connect their experiences in the studio to the larger environment. They create three-dimensional constructions using a variety of materials. Using varying weights of paper each class built a city, each student creating their own stable and steady construction. In clay, second graders think about their community and each choose someone to make out of clay, the goal was to make sure the bodies parts were connected well using the “3 S’s.” In addition, students continue to develop their creative problem-solving skills and ability to work successfully in a collaborative space. In the second semester, second graders continue to develop their creative problem-solving skills and ability to work collaboratively in the studio space. As part of the second semester’s focus on Communication, students create clay sculptures representing a memory around food. Through this activity they also have a chance to reflect on their clay process. In preparation for their spring visit to Storm King Art Center, students focus on drawing from observation and thinking about how the environment can impact the works of art. We then spend time focusing on a technology and art collaboration, creating soft circuits with e-textiles. This experience allows students to use their knowledge of materials to make individual choices for their creations. In addition, students master fine motor tasks, such as sewing and cutting. They end the year creating self portraits through printmaking, taking the time to draw from observation focusing on what their eyes see. During the first semester of Wellness, students focus on important developmental physical skills while connecting to the theme of Community and concept of Structure. Students begin the year by working on sportsmanship and teamwork through the use of cooperative games. Following cooperative games, the students dive into a study of the human body. The students work on their understanding of how the skeletal system is structured and their interconnections with other physiological aspects on the body. They also study the structure of the brain and how it can help us be better movers and learners. They incorporate mindfulness practices during our study of the brain and throughout the year and fitness activities and a nutrition study on My Plate. Following the human body unit, the students work on their juggling skills. In the second semester of Wellness, students work on building trust, practicing cooperation, improving general fitness and solidifying the eight basic locomotor skills. They worked with partners, small groups, and the whole class to enhance their verbal and nonverbal communication by working together in order to complete challenges. In addition, how to self communicate in a positive manner when a task feels difficult. They learned throwing, catching with a partner and using different strategies to catch equipment that is going away from the body. The students practiced striking with volleyballs and understood the basic skills involved in a volleyball game. The parachute study emphasized community building and exploration.